Radio Spaceshuttle 13800 kHz, 22mb Sundays starting 5th of April, 18:00-19:00 UTC. 4026 1710 Laser Hot Hits. Depeche Mode "New Life." SINPO 34333. 6240 1837 Radio Caroline Int. Dance music. SINPO 44433. 6281 1700 VO Ukrainian Crimea. IDs, patriotic music. SINPO 34333. 6285 1955 Radio Laguna. Tears for Fears "shout." SINPO 44433. 6287 0948 Misti Radio. Coldplay "Rule the World," ID, greetings. SINPO 34333. 6290 1633 Hitmix Radio. Schlager. SINPO 44433. 6295 0945 Radio 42. Music and ID, then off. SINPO 24332. 6295 1841 Radio Python. Scissor Sisters "Comfortably Numb", ID, greetings. SINPO 44433. 6307 0915 Radio Caroline-Rainbow. Jingles and music. SINPO 24332. 6323 1650 Radio Underground. Back on the air after antenna problems, ID, greetings, Nena, utility splash. SINPO 53443. 6380 1644 Radio Jamaica. Music, just about audible. SINPO 24332. 6397 1732 Radio Black Bandit (tent). Polka. SINPO 54444. 6422 1744 Ronnie AM. Pussycat song. SINPO 44433. 6808 1726 Sundown Radio. ID jingle, instrumental music. SINPO 44444. 6827L 1823 Radio Anthony. Pop. SINPO 34433. 6950 1948 Radio Mirabelle. French pop. SINPO 44433. 9290 0910 Radio Mirabelle. Dance music. SINPO 45444. 9300U 1833 Radio Barracuda. Oldies. SINPO 44433. 4026 2115 Laser Hot Hits. Dance music. SINPO 54444. 6265 2050 Delta Radio. Kraftwerk "The Robots," jingle ID, techno. SINPO 54444. 6288 2058 Odynn Radio. IDs, greetings, "So Far Away from You." SINPO 44433. 6307 2041 Radio Metropol. "Imagine" sung by woman, jingle IDs, closedown. SINPO 44333. 6485 2037 Premier Radio Int. Lisa Stansfield "Been Around the World," ID, greets. SINPO 44333. 6803 2055 Radio Pioneer. Electro music. SINPO 54444. 6950 2045 Radio Mirabelle. French pop. SINPO 34333. Article says special broadcast is on Good Friday (apr 3) at 10am (BST). 4026 2158 Laser Hot Hits. Mike Andrews show. Patsy Gallant "From New York to LA," SINPO 54444. A quick reply from Italian station Radio Latino. In his reply the operator said: "Radio Latino has been broadcasting irregularly since 2006 with low power (50 watts p.e.p.) from central Italy. You have been listening to one of the first test trasmission of 2015 with the new transmitter (500 watts p.e.p), but we still have to set up correctly the audio section of the station (that's why you heard some overmodulation). The antenna at the moment is a inverted V dipole working from 7530 to 7610 khz. In the next weeks I should be quite active from 7530 up to 7610 (main frequency will be 7540) during evening and night and, during 2015, we hope to be on air regularly on a daily basis, with one hour program." Thanks a lot for this enormous feedback on our transmission last weekend in the 31m band !!! Your response on our weekend-shows makes our life, don't forget, we give our free times just to enjoy you, we spend our money in the transmission to give you a beautiful weekend, so we are almost very happy about every mail coming in, not only for asking for a QSL Card. Great things are coming up at the Easter-weekend, we will do 8 hours of program on Easter-Saturday up to Easter Monday. 3905 1652 Misti Radio. Rock n roll. SINPO 24332. 3905 2013 Radio Alice. Dutch & country music. SINPO 44433. 3930 2300 Radio Mirabelle. ID and closed down. SINPO 34333. 4026 1657 Laser Hot Hits. Dance music, jingles. SINPO 44433. 4026 2255 Chelmsford Calling v LHH. Greeting listeners, mention BDXC. SINPO 54444. 5897U 2004 Radio Barracuda. "My Way," SINPO 44433. 6205 1948 Radio King SW (tent). Marilyn Manson. SINPO 43433. 6210 1942 Shortwave Gold. "Everybody Wants to be Together," ID jingles. SINPO 44444. 6215 1615 Radio Uferlos. GM pop, greeting Swedish listener. SINPO 44433. 6225 1715 Radio Onda Caliente. Move from 6240, best in narrow filter. SINPO 34333. 6380 1620 Radio Witte Reus. ID, DT talk, pop, sign off. SINPO 44433. 6380 1642 Radio Montferland. ID, greetings, pop, sign off. 6400 1647 Radio Panda. "Man of Action," off, fair levels. SINPO 24332. 6910 0952 Misti Radio. Rock n roll. SINPO 34333. 9510 0947 Radio City v IRRS. "Tie A Yellow Ribbon," ID, email address. SINPO 55555. 9560 0940 Radio Mi Amigo v Kall (pres). Music just audible, pres Mi Amigo test. SINPO 25332. 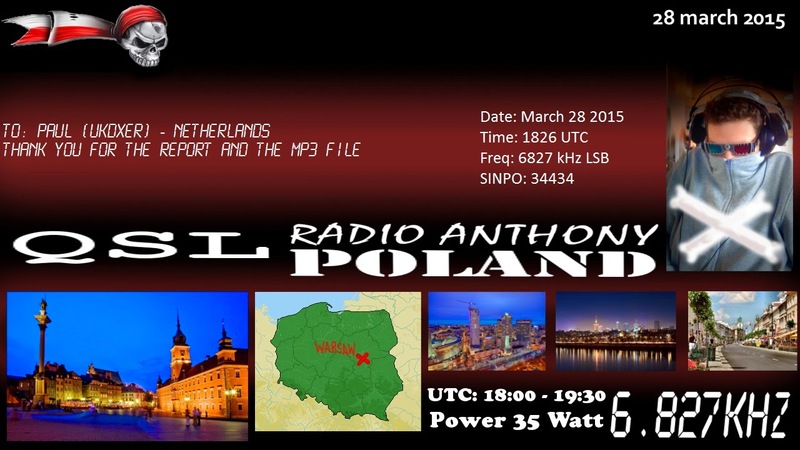 "Oldies and very Goldies"- strangers of the night program including "Hobbart Radio Pirate News" and "Spaceflyers Letter Box" on 9600 kHz, 31mb sunday 22nd of March 2015 18:00-19:00 UTC. 3932 1825 Free Radio Victoria. Dutch music, ID, greetings, testing old transmitter. SINPO 34333. 4026 1809 Laser Hot Hits. Paul Stuart show. "Twist & Shout," "You're the One that I Want." SINPO 44444. 6205 1855 Unid. Relay of Dutch commercial station, fast talk, dance mx. SINPO 44444. 6290 1836 Radio Odynn. Bob Marley, then Rolling Stones, ID jingle. SINPO 44433. 6380 1801 Radio Ronnie AM. Kim Wilde "Kids in America," ID, greetings. SINPO 44433. 6920 1738 Radio Mirabelle. Instrumental music. SINPO 44333. 6289 1805 Radio Experience. "I Want to be A Hippy," ID, "Spaceman" then closing down. SINPO 34333. 6289 1817 Radio Gigant. "Whiter Shade of Pale," report to Experience. SINPO 34333. 6289 1821 Radio NMD. QSO with Gigant/Experience. SINPO 24332. 6305 1832 Radio Telstar. Chris Isaak "Wicked Game," ID, greetings. SINPO 44433. 6803 1811 Radio Pioneer. Oldies. SINPO 24332. Last week a special programme marking the 40th anniversary of Radio Milano International was broadcast by several Italian stations on shortwave and medium wave. One of the relays was by Enterprise Radio and here is his special QSL. 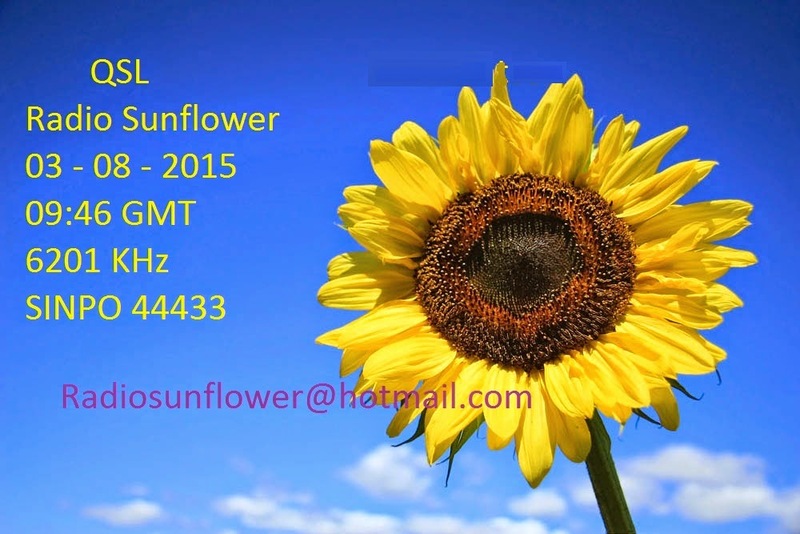 New Dutch station Radio Sunflower sent me this colourful QSL. This was his 5th show and he uses a power of 140-150W. Thanks for the great QSLs. 3930 2157 Radio Batavia. BZN song, ID, greetings. SINPO 34333. 4026 2110 Laser Hot Hits. Sister Sledge "Lost in Music," non-stop music and jingles. SINPO 54444. 6950 2127 Premier Radio. John Lennon "Imagine," Elton John "Candle in the Wind." SINPO 43433. "We are delighted to announce that from the 1st June 2015, KBC will be heard daily on medium wave. We will broadcast on 1602 kHz between 07.00 and 19.00 CET from transmitters aboard the LV Jenni Baynton. "We hope you enjoy our new outlets and will join KBC on MW, SW, DAB+ and Online. Check out our website kbcradio.eu and our FB page facebook.com/TheMightyKBc for all the latest news." Just to clarify: KBC will be replacing Radio Waddenzee on 1602 from 1 June. There will be no change to Radio Seagull, which will continue to broadcast on 1602 at 1900-0700 Dutch time. Later this year, both stations will share a channel on the regional DAB+ mutiplex. Radio Seagull will continue 24h on the internet. 3905 1904 Skyline Radio Int. "Is this the Way to Amarillo?" ID, greetings. SINPO 54444. 4026 1800 Laser Hot Hits. "Don't Take Away the Music," SINPO 54444. 6205 0919 Radio King SW. Killers "Mr Brightside." SINPO 34333. 6254 0930 Radio Marabu. Jingles in GM/EG, GM talk, alternative mx. SINPO 44433. 6294 1741 Free Radio Victoria. Dutch songs. SINPO 44444. 6298 0940 Misti Radio. "Going Loco Down in Acapulco," SINPO 34333. 6300 1752 Radio Tango Italia. Tango music. SINPO 44333. 6304 1521 Magic AM. Human League "Open Your Heart" ID. SINPO 54444. 6385 1514 Radio Witte Reus. Dutch music. SINPO 44433. 6385 1533 Radio Baken 16. "Sugar Baby Love," QSO Witte Reus. SINPO 43433. 6385 1805 Radio Ronnie AM. Abba "Day Before You Came." SINPO 44433. 6395 1545 Radio Ronalisa. Dutch instrumental music. SINPO 34333. 6400 1738 Radio Carrierwave. "Reet Petite," SSB QRM. SINPO 43333. 6403 1458 Sundown Radio. "Gimme Dat Thing." SINPO 54444. 6425 1746 Studio 52. Neil Diaomd. SINPO 54444. 6450 1518 Radio Readymix. Rock, ID, not easy to hear. SINPO 24332. 6450 1557 Radio Ronalisa. Move from 6395. Golden Earring. SINPO 44433. 6525 1553 Radio Baken 16. "Blockbuster," then Abba "SOS." SINPO 54444. 6803 1530 Radio Pink Panther. "Our Love is History." SINPO 54444. 6920 1735 Radio Mirabelle. French pop. SINPO 34333. 6925 1509 Trans Europe Radio. Bananarama "Venus." SINPO 44433. 9295 1601 Radio Focus Int. "Once Bitten Twice Shy," "Man of Action." SINPO 44433. 9475 1732 Radio Arcadia. Jazz music, and off. SINPO 34433. 3905 2017 Radio Alice. Dutch instrumental music. SINPO 44333. 4026 2045 Laser Hot Hits. Heaven 17 "Crushed by the Wheels of Industry." SINPO 54444. 5897U 2023 Radio Barracuda. Italian pop. SINPO 44433. 6803 2027 Radio Pioneer. David Bowie "Golden Years." SINPO 34333. 6850 2021 Radio Arcadia. "After the Love Has Gone," greetings, jingle ID and off. SINPO 44433. 6245 1804 Radio Casanova. Dutch music, ID, closing down. SINPO 54444. 6290 1758 Radio Mirabelle. Country music, ID and signing off. SINPO 44433. 6290 1818 Misti Radio. "Ferry Cross the Mersey," ID. SINPO 34333. 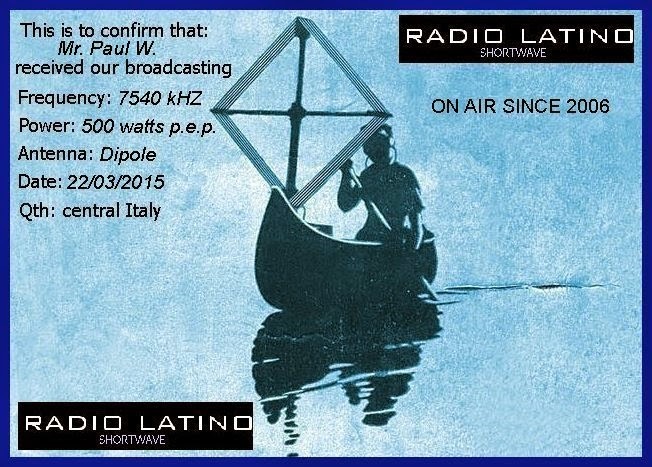 6210 2028 Radio Milano International (via Shortwave Gold?). Disco with Italian talk.. SINPO 44444. 6300 2020 Radio Milano International (not sure about this relay but it was strongest up to S9+20dB). Disco. SINPO 54444. 6940 2053 Radio Milano International v Enterprise. Same programme as 5897/6210/6300. SINPO 54444. 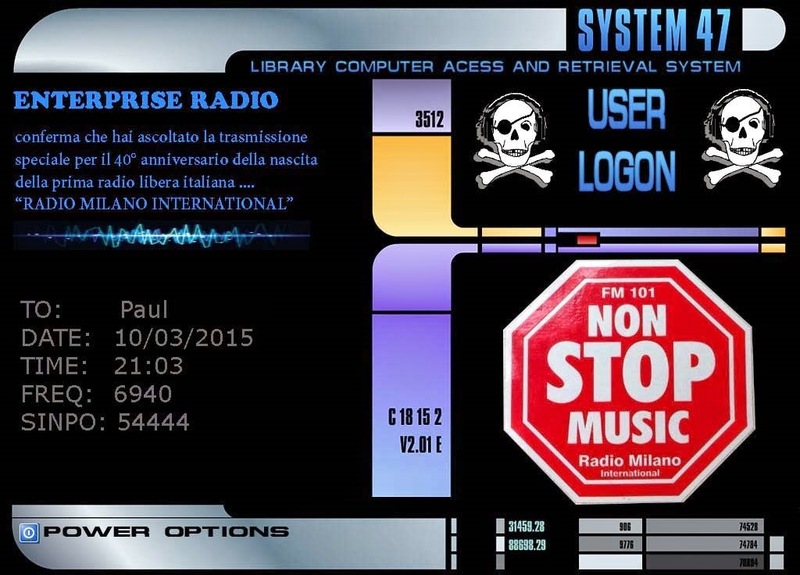 At 2100 UTC 5897U/6210/6300/6940 broadcast a tribute to RMI 40th anniversary programme in Italian. The programme was also broadcast on 4 medium wave frequencies in Italy. 3930 1850 Radio Focus Int. Rock music. SINPO 34333. 3930 1827 Radio Focus Int. "Hot Summer Nights," then Helen Shapiro "Not Responsible," not //6285. SINPO 44333. 4026 1815 Laser Hot Hits. Rock. SINPO 54444. 6070 0844 Radio Mi Amigo v Ch 292. "Delilah" in German, GM talk. SINPO 55544. 6240 1727 Radio Flying Dutchman. Dutch songs, some utility QRM. SINPO 53443. 6260 1749 Radio Casanova. ID, Dutch songs. SINPO 44433. 6285 0835 Radio Focus Int. Chris Crosby "You and In Love," ID, mention website. SINPO 44433. 6292 1803 Radio Johnny Tobacco (Black Bandit). Polka. SINPO 54444. 6300 1754 Radio Montferland. "Don't Leave Me This Way," ID, greets, The Bangles. SINPO 54444. 6803 1744 Pink Panther Radio. Wham "Wake Me Up," ID jingles. SINPO 44433. 6850 1739 Radio Mirabelle. "Silver Bells," SINPO 34333. 6950 1733 Big Podcast Radio v unknown relay. The weekly radio show from Moscow. SINPO 33333. 4026 1818 Laser Hot Hits. "Going Back to My Roots." SINPO 44333. 6290 1754 Radio Black Arrow. First Class "Beach Baby", greetings. SINPO 54444. 6301 1801 Radio Montferland. Instrumental music, ID, greetings. SINPO 55444. 6325 1745 Radio Zeewolf. "Boys Boys Boys," ID. SINPO 54444. 4026 2133 Laser Hot Hits. Gary Drew show. Soul & funk. Strong but utility QRM. SINPO 53443. Utility moved down the band by 2139 leaving LHH in clear - 54444. "Early Bird Fly"- international music magazine on 6070 kHz, 49mb Saturday 7th March 2015, 04:30-06:30 UTC for our European and Newfoundland ;) listeners. "Power of Rock" on 9600 kHz, 31mb sunday 8th March 2015, 18:00-19:00 UTC using omnidirectional HQ-antenna to a bit larger listening area. Please send ideas of programs and music you like to hear from Spaceshuttle. We would like to fulfill your requests in special musical shows in future. I wish you will have fun with our programes also in future! Please tell you thoughts to us by e-mail: spaceshuttleradio@yahoo.com. During this weekend we shall send e-mail verifications to all reports came to our e-mail from transmissions made this year and reports got to our P.O.Box until this (you got first our e-mail QSL and later posted one to your mail addresses). 4026 2140 Laser Hot Hits. Gloria Estafan, the FSN ad. SINPO 54444. 6940 2130 Hobart Radio Int via Premier. Free radio recordings. SINPO 44433. From March 8th until March 22nd we will be off air, due to preparations for our second power amplifier. Exception: On March 22nd from 10 to 11 UTC you can listen to a new program for the DARC (German Amateur Radio Club) on 6070 kHz with 100 kW; perhaps we can start the 10 kW transmitter on the same day in the evening. During the next weeks we hope that we can increase power as planned. Now, when summer comes and the skip zone during the night becomes smaller, a lot of listeners asked us tu run the station at nighttime, too. We would like to, but the problem is, that this would duplicate the energy costs, without creating any new income. And because these costs (not to mention all the other costs) are only covered for about 60% by rented airtime, this is not possible. We don't want to ask for donations, but we can make you a proposal: Who wants to support us, can book sponsoring for broadcasts at night. This can be for a whole night with 12 hours, or 2 x 6 hours in the evening. For this we need 36 €; who can't afford this, may book 6 hours for 18 €. The sponsor can choose, if he wants in his time to hear our regular music program, or a re-broadcast of an Offshore Station of his choice. If he wants, his name will be published on our homepage and in our news mail, and in short spots during his programme, that we produce without any costs for him (for Offshore re-broadcasts only possible at the beginning, at the end and between blocks of programming). Or, if wanted, completely anonymously. Or you subscribe for maybe every first Saturday night each month, or how you like; can be canceled at any time. If you like to support us in this way, please send us a mail! 4026 2025 Laser Hot Hits. Dance music. SINPO 54444. 5897U 2113 Radio Barracuda. Elvis Presley "My Way." SINPO 34433. 6940 2020 Hobart Radio Int via Premier. DX Extra, reading out free radio logs. SINPO 44433.